Well, if we're taking votes... all I have to say is Judy, Judy, Judy... hot-cha-cha! That diagram is teh awesome, are they online somewhere? ...That diagram is teh awesome, are they online somewhere? It's not CG guys but real modelers. And they are sometimes extremely obsessive about precision and detail. Many of them have actually worked on studio models or have taken painstaking measurements of them. And they often post blueprints, drawings or orthos. (One forumer named Starseeker is quite generous with his info.) It's a good resource for us CG folk. I agree. The crash sequence was very good for its day. I've always wondered if they suspended the model from a helicopter or large crane. The scale of the ship is quite convincing compared to the landscape and fog. So, here are a few clips of my J2 in flight - in glorious B&W of course! No crumpled aluminum foil in sight. This is absolutely FANTASTIC !! That test reel looks amazing! The black & white and soft focus add a lot of realism to it. I mean, it really looks like old test footage instead of modern CGI. FX artists from back in the day would have killed for such detailed backgrounds, though. They often had to do with pin pricks through black velvet fabric or glitter dust sprinkled across black canvas. We certainly have some a long way from those days! Fantastic ! The title card is spot on as well ! I realize that B&W may not be everyone's cup of tea, but when it comes to the classics like Lost in Space there is nothing sweeter. Thanks! I love B & W. It certainly gave the first few episodes an added gravity to the darker aspects of the story. A bit noir-ish. 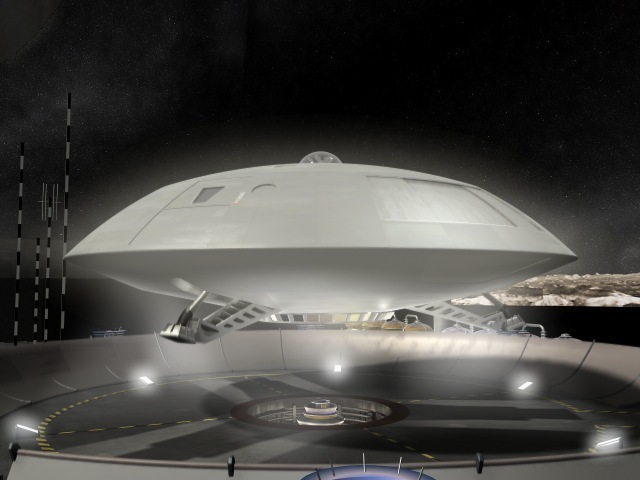 I'm still working on the lower deck, slowed down because I'm revising elements that have become more clear during my research into the spaceship. 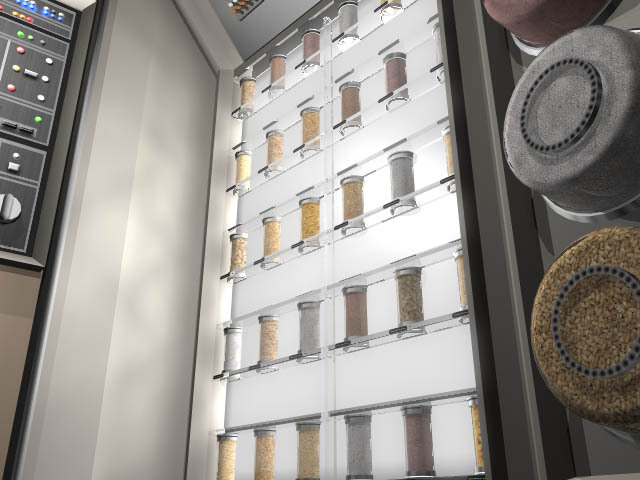 Here are a couple of detail shots of the Seed Bank, located on one of the walls of the Galley. 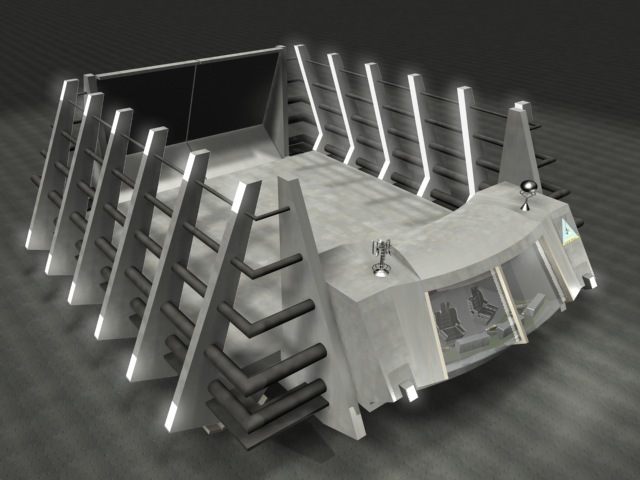 I'm imagining that the lighted panels were some kind of field generator meant to keep all of the foodstuffs from spoilage during the intended 5-year voyage, although I'm sure the show's designers didn't necessarily think of them this way. 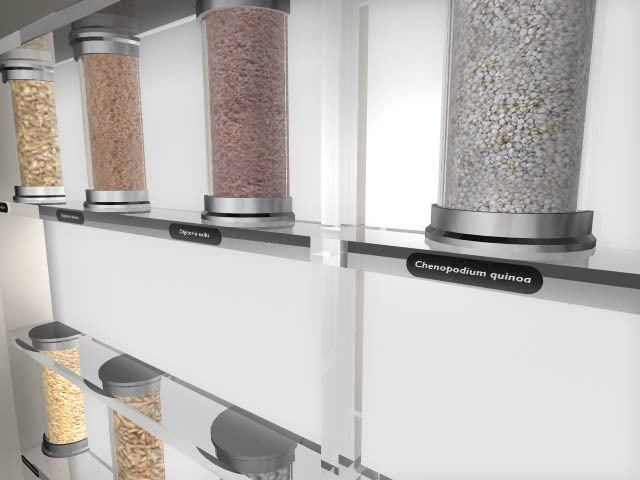 Oh, and there is one container marked "Triticale quatro," just for my own amusement. Star Trek fans would probably recognize the homage. 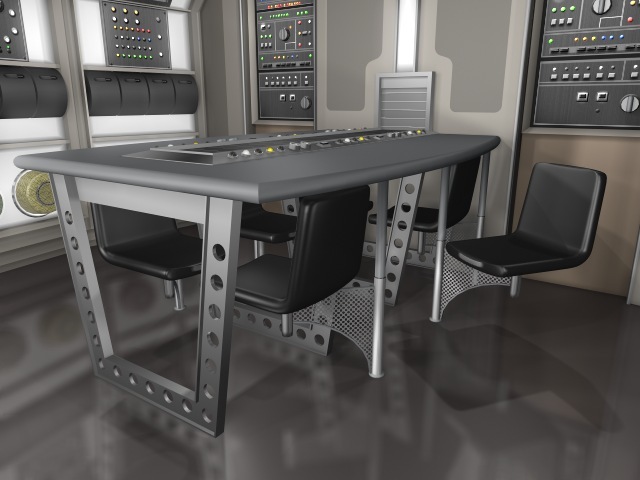 Oh, as a follow-up to the last couple of images, I also discovered that the Galley table had integrated seating, although the two inner U-shaped legs were removed after the first few episodes. I'm assuming the actors kept hitting their shins on them. Apart from being a wheat hybrid, now you run the risk of having your ship infested with small, fuzzy creatures. Just glue some rabbit ears to the robot's head. Getting ready to generate an animated launch sequence. Here are some test shots. 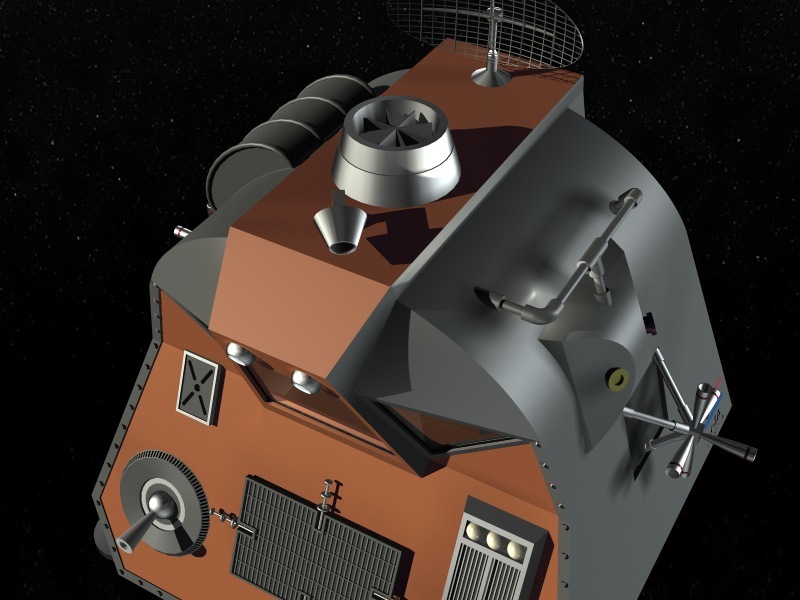 The Jupiter 2 was able to launch at 80% power without long-term radiation damage to the crew. A full-power launch - causing the ship to glow brightly - required the protection of the stasis tubes. Heh, heh. I just remembered that (if I'm not mistaken) the first episode of "Lost in Space" mentioned that it was set in the year 1999. Seems Irwin Allen had a very optimistic view of where the US Space Program would be some 30 years beyond when the show was produced. It's sad in a way that we haven't been able to live up to the expectations of such sci-fi luminaries. I also have a slightly off-topic question: Does anyone know where I might be able to find a decent .3ds or .max model of the movie version of the Jupiter 2? The film certainly has its faults, but I loved the design of the J2 and my own attempts at modeling it have met with little success. Thanks in advance if anyone can help me out with this. Forgive me if you've addressed this already (didn't read the whole thread), but the Jupiter II in the original series was launched from a tripod launch cradle, not from its own landing gear. Other than that, you modeling is absolutely fantastic. Yes, Duncan, that's true in the series when the J2 took off from Earth. Here, I'm imagining a pre-expedition shakedown flight. A quick trivia question here....anyone know if there was supposed to have been a Jupiter 1? Brilliant work! The old girl looks great, nice hull plating, too. I thought the LIS movie was swell, I had hoped to see at least one sequel. I needed a "quick and dirty" cargo transport for a couple of my scenes. I designed this heavy lifter, which is about the same size as the Jupiter 2 and uses the same Unitectic Gravity Drive engine. The "ribs" I imagine to be force-field generators to stabilize the cargo, and are modeled after the internal rib structures of the Jupiter. A few questions though. Suspeneded Animation tubes? Does it need them? Range? And so on. Hi Nick. No stasis tubes. 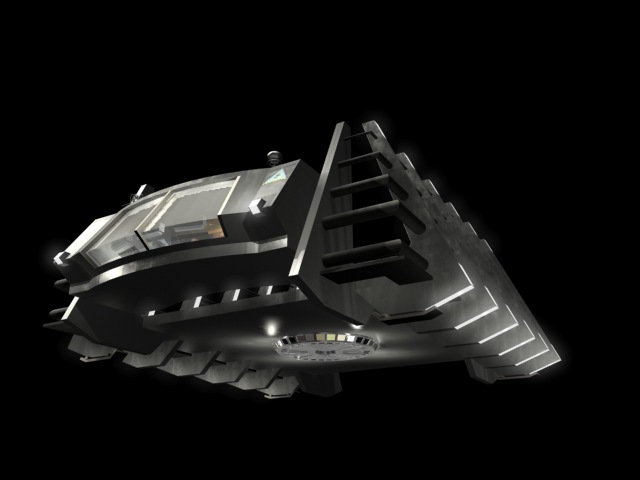 This cargo ship is being used in a scene taking place at the Alpha Control shipyards. 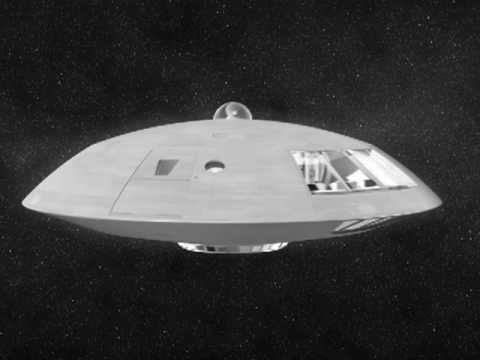 While Lost in Space only featured the Jupiter 2, it stands to reason that Alpha Control had to have an extensive support and construction system in place, especially when the show stated that "up to 10 million families per year" would eventually make the trek to Alpha Centauri. 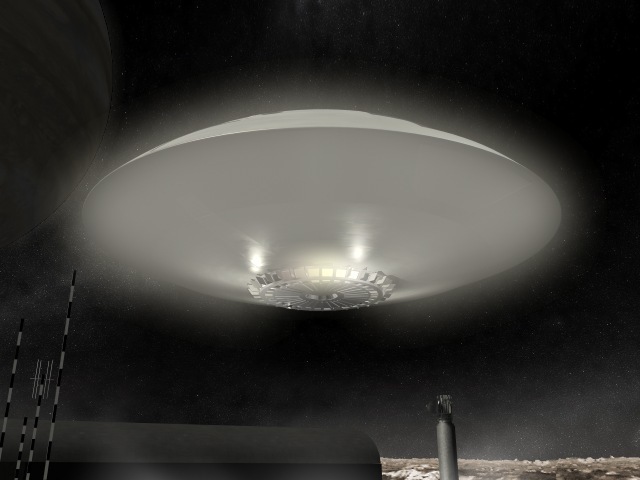 All ships seem to use the Thompson Unitectic Gravity Drive as their primary propulsion system, which is the disc-shaped device below the ship. Rotation of the drive coils produced the plasma glow as a byproduct. I assume the Thompson Drive would be a relatively cheap, compact, mass-produced item. It showed up on another Earth ship during the show's run as well as on the small Space Pod. It utilizes "deutronium" as fuel. Finely-tuned maneuvering of the ships was accomplished with traditional rockets, though perhaps not using traditional fuels. The lighted structural ribs - A ubiquitous item in the Irwin Allen world - seem to have multiple functions. Not only as sources of lighting but perhaps as generators of a mass stabilization field, or a force field. The rib lights pulsated on occasion aboard the Jupiter 2. Maybe these are analogous to Star Trek's inertial dampers. Computers that have some sort of visual-pattern interface. Okay, this may be a bit far-fetched, but the Robinsons seemed to be able to "read" the computer displays based simply on the pattern of flashing lights. A cheap trick in the TV world (not to mention the ready availability of real Electrodata Consoles they used as props on the show), but hey, engineers today are experimenting with direct connections to the brain. What if they developed a "pattern language" that is analogous to shifting hieroglyphs? Easily visible across distances! A 1950's - inspired design aesthetic. Clean lines, basic geometric shapes and lots of glowing things. Again, perhaps data communications occur through pattern recognition and not necessarily words. Simple shapes that can generate geometric fields and effects. Compact and efficient devices. But every once in a while you get an additional taste of industrial aesthetics as well. Anyhow, these are a few guidelines that I am trying to follow. Mostly because my video will require a backstory, including previously-unseen ships and devices. Which can be a helluva lot of fun! 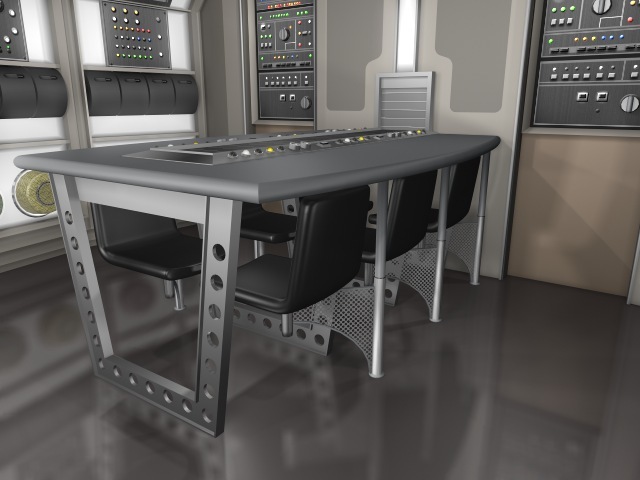 BTW, as an example of the implied extent of Alpha Control's facilities on Earth (and for those who might be unfamiliar with the show) here's a screen shot from the 1st episode. As to the computers, I have been thinking about that. Since I saw the original pilot on line(Hulu). What it suggests to me, is that VDTs were never intergrated with computers. That is, no CDC 6600 et el. The CDC 6600 was the first computer, that instead of using a hard wired control panel, use its two VDTs to do the job. This further shows the possiblity that no complex operating systems existed. One of the things I have come to appreciate over the decades, is the Robot's 110 CPUs. This idea was way ahead of its time. 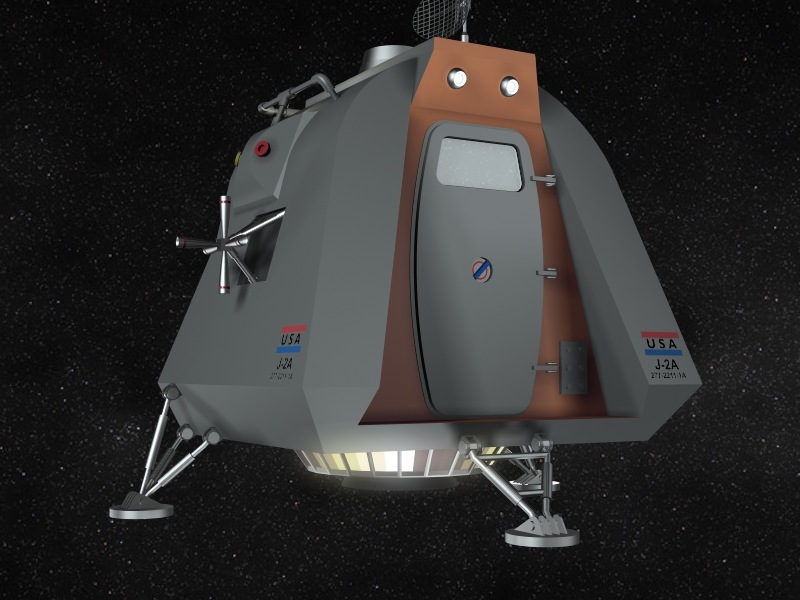 I decided I ought to model the Space Pod, the small shuttle vehicle aboard the Jupiter 2. 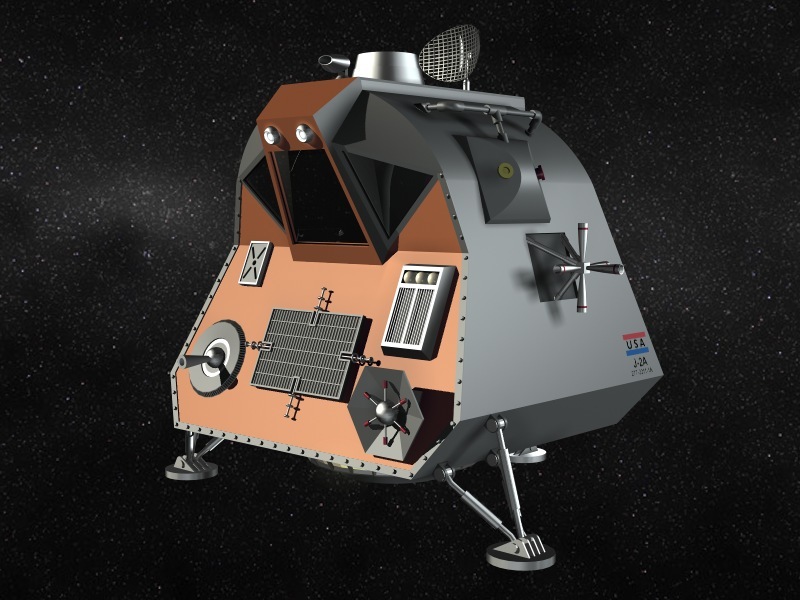 It was designed after the NASA Lunar Lander, although this appeared on TV a year before the real Lunar Lander made its debut! Various sensors included atmospheric sampling, solar radiation sensor, radar, an NGS scanner, etc. It also had attitude rockets although it was primarily powered by a smaller version of the Unitectic Drive. 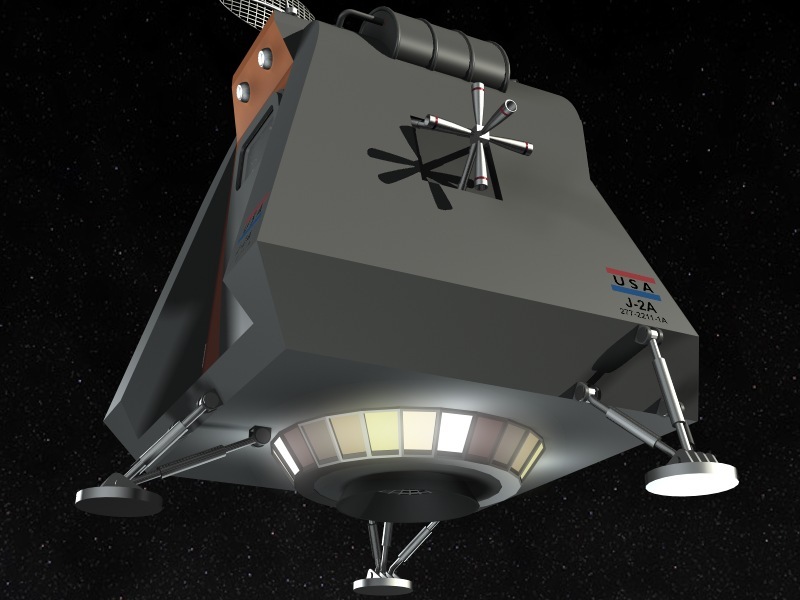 I always thought the lander was a little weird-looking, despite its NASA pedigree. It didn't match the smooth surfaces of the J2 or the sturdy functionality of the Chariot. Also, piloting the thing while standing is just asking for trouble. If something goes wrong, you're suddenly in the equivalent of an elevator falling from 10,000 feet up. Pilots are harnessed tightly into their seats for a reason, y'know. Ranting about the design aside, your model of the little bugger looks great. Now all you have to do is fit it into the J2 without driving yourself insane. On a little side note. I've just looked back over this threat at the ages of the people posting. While not everyone's age is displayed, there is a clear demographic here. We all seem to be in our 40s. Just thought I'd point it out. Makes sense to me. I doubt that many people under 30 even know what "Lost in Space" is. Of course, that makes the franchise ripe for yet another reboot. You could even tap into the recent TV zeitgeist by giving it a subtle title change. Tell me "Lost: In Space" wouldn't make one hell of a popular series! The pod is looking great as usual as does your freighter. In the Alpha Control Techinical Reference Manual, it does mention a Jupiter 1 that had been destroyed (presumably by saboteurs). Then the Jupiter 2 was built, and that was the one that made it into space with the Robinsons. 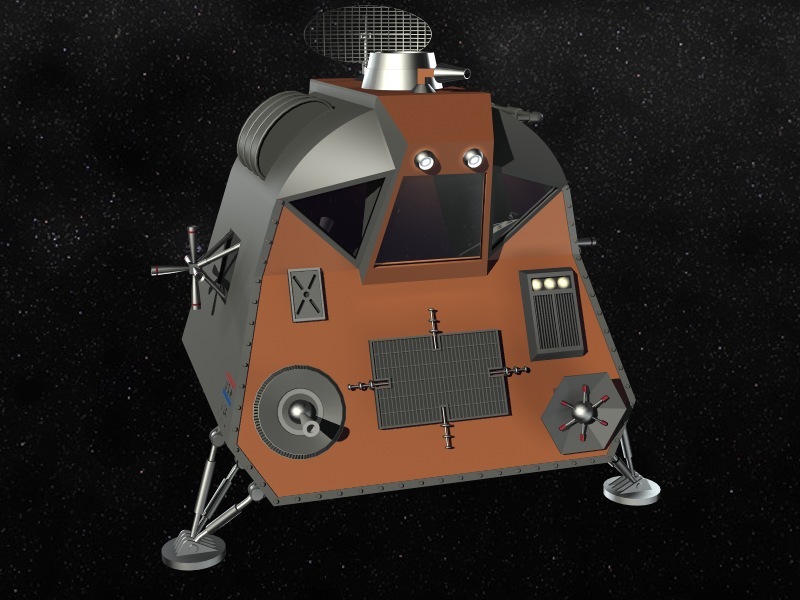 In the original unaired pilot, the ship was called the Gemini 12 with only a single deck and no airlock. As for the movie, I think Gary Oldman did a great job as Dr. Smith. 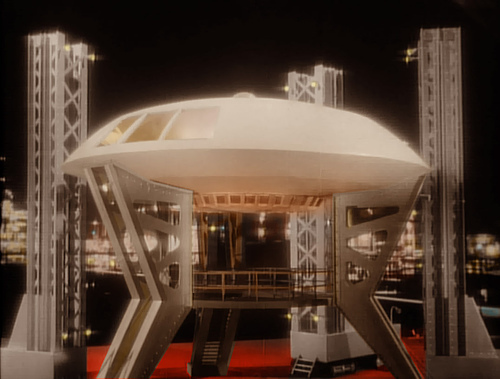 Matt LeBlanc did an okay job as West and it was great to see June Lockhart, Marta Kristen, Angela Cartwright and Mark Goddard appear in the movie.The new design of the Jupiter 2 was definitely a lot larger and more spacious. But, I still prefer the design of the 60's Jupiter 2. 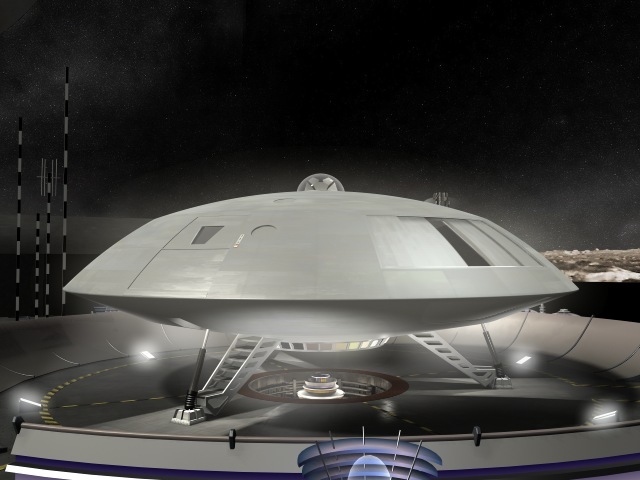 However, it didn't make sense to have it inside the saucer for lift off into space, other than to provide that nostalgia feel and provide a transistion to the new design. Blowing the saucer apart to show the new Jupiter 2 doesn't make sense either. But if Earth was dying because of polution anyway, what's a little more space junk? A reboot of the series (if done properly) would be great to watch. It would have to be a serious series, without the monster of the week (especially giant talking carrots with a human face). Smith would really have to be a person with no morals or conscience at all. There would be more tension between civilian (Robinson) and military (West). There should be ongoing backstories for the characters as well instead of a totally new story each week. Hmmmm.... kind of sound like Stargate Universe. Anyway, I am always impressed with your work Avian.